This question was popped in front of me , when i finally decided to pursue my next certification in the Design field. Some people say that CCIE is somehow act as a prerequisite before doing CCDE. However, in my point of view it really depends on which background you are coming and what you are trying to achieve in your future endeavors. Although cisco have no prerequisite for CCDE, you can do CCDE even if you don’t have CCNA, however it is recommended that you have at least 7 years of experience in network design , implementation and operation. In my perspective CCIE is all about implementation and troubleshooting, however on the other hand CCDE is the mind and soul behind big designs. CCDE is a control plane driven test, and in cisco world they call it as a Layer 3, where business and technology meet together. Large common problem areas in designing a network. What tools do you have to solve the problem? Domain deals with question related to Availability , Serviceability , Scalability, Security and Flexibility. There are three main drivers. Firstly, Business drivers are supposed to be at layer 9 and answers questions related to scale, continuity , expense and advantage. Secondly , Application drivers are at layer 7 and deals with bandwidth, delay, jitter and continuity requirements. 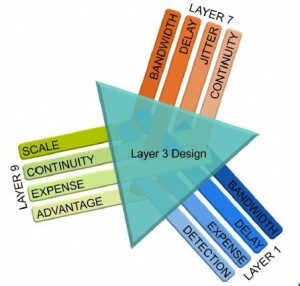 Lastly, Link drivers works at layer 1 and provide bandwidth, delay , expense and detection like features. Cisco call it layer 3 aka control plane , where all above drivers meet and build networks that will support business and applications requirements on top of available links and hardware. I have enjoyed my 2 years CCIE ride and I did lots of implementation and design work related to Security , Data Center , Service Provider, Wireless, F5 and what not. As my CCIE certification is about to expire very soon, I was a bit confused from past 1 year about the next certification . I have given almost every technology its holy share. I read all the CCIE blueprints cisco have in its database, and then i finally came across CCDE blueprint and the recent development in this area amazed me. Well to cut long story in short , CCIE is all about implementation however CCDE is the design and mind behind it. As now i have finally decided to do CCDE , my first step is written exam and that i am giving it very soon. Please hang around as WHY, HOW ,WHERE and WHEN questions of networking field will be answered here..